Become one with nature and battle demons in Capcom's ambitious sequel. Capcom's Okami tells the story of Amaterasu, the sun goddess reincarnated as a white wolf, on a journey to rid Japan of demonic forces. Both beautiful and enthralling, the critically acclaimed adventure impressed audiences on PlayStation 2 and Wii. Now they'll be able to enjoy this attractive world on the go, as the publisher plans to release a sequel, Okamiden, on the DS in 2011. This time, however, you won't play as Amaterasu. 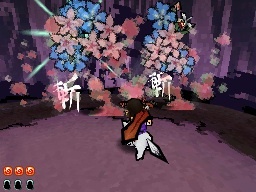 Instead, you'll battle evil as the pintsize wolf cub, Chibiterasu, Amaterasu's kid. Although he's not as powerful as his mama, Chibi combines his powers with a small boy named Kuni, who rides his new buddy throughout Japan; he's one of several partners you'll meet. Together, you must rid the land of a new evil while restoring nature's beauty. That sounds like a tall order for a couple of pipsqueaks, but they have some key abilities that'll aid them on their quest, beginning with the Celestial Brush from the first Okami. By pressing either the Left or Right trigger, you enter Celestial Brush mode and can dramatically effect the environment by drawing on the touch screen. For example, if you see a dead tree, encircling it causes flowers to grow. You can also draw a circle to create the sun, thus providing light to a dreary place, or use a similar circle to rebuild a bridge. Even objects within the environment don't stand a chance against your might. 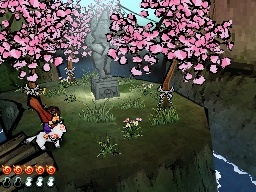 If Chibi happens upon a rock blocking his path, a quick slash will cut it in half, granting access to a previously unreachable area. You'll also use this to solve puzzles. To direct Kuni, simply draw a line and he'll follow it without hesitation. This proves useful to complete challenges that require both characters to split up. Take the classic puzzle where both heroes must stand on two switches to open a door or lower spikes. After walking over the first switch with Chibi, you'll draw a line to the other switch and Kuni will follow orders. As expected, the brush has plenty of other uses, especially when it comes to attacking demons, monsters and ghosts. While Chibi has a standard claw attack, you'll need the brush to tackle the more difficult enemies, particularly bosses. Similar to Nintendo's The Legend of Zelda franchise, a boss is sort of like a puzzle with multiple stages, and you must figure them out using the brush. Capcom wouldn't elaborate, but it did show us an image of Master Anura, an ugly toad like creature with a long tongue. We look forward to squaring off against that guy. For now, we'll have to settle for a handful of images. If Capcom pulls this off, Okamiden will be a deep, gripping and attractive sequel that'll keep DS owners busy for weeks. Expect more info in the near future, as well as hands-on impressions during this year's Electronic Entertainment Expo.